What is Percorten-V (desoxycorticosterone pivalate injectible suspension)? Percorten-V (desoxycorticosterone pivalate) is the only medication approved by the FDA for treating Canine Addison's Disease (hypoadrenocorticism). Percorten-V is a corticosteroid used to treat conditions in which the body does not produce enough of its own steroids, such as Addison's disease. It may also be used for purposes other than those listed here. Percorten-V requires a prescription from your veterinarian. You will need a syringe to use Percorten-V, but it is not included in the package. Please see 3cc (3ml) luer slip syringe with 3/4" 22 g Needle. Canine Addison's Disease is a condition where a dog's adrenal glands don't work properly. Normal adrenal glands produce mineralocorticoids that help regulate many bodily functions such as metabolism, blood pressure, and stress response. Percorten-V is a replacement therapy for the mineralocorticoid deficiency in dogs with Addison's disease. Do not use any preventative vaccines such as Percorten-V without checking with your veterinarian. Talk to your veterinarian about any side effects that seem unusual or bothersome to your pet. Percorten-V should not be stopped suddenly. Percorten-V should not be given to pregnant dogs, or dogs suffering from congestive heart disease, severe renal disease or edema. What is the most important thing I should know about Percorten-V? Percorten-V is a prescription medication that is commonly used by veterinarians in dogs for the treatment of Addison's disease. Percorten-V is available as a 4 ml multi-dose vial containing 25 mg/ml. Percorten-V should not be stopped suddenly. Irritation at the injection site may occur. Percorten-V is administered IM (intramuscularly). Do not administer IV (intravenously). Contact the veterinarian if the pet develops behavior changes, swelling, or unusual weight gain. Animals suffering from hypovolemia, pre-renal azotemia, and inadequate tissue perfusion must be rehydrated with intravenous fluid (salid) therapy, and primary renal disease should be ruled out before starting Percorten-V therapy. Percorten-V replaces mineralocorticoid deficit only and glucocorticoid replacement must also be provided with glucocorticoid hormones. For complete safety information, see product label. What should I discuss with my veterinarian before giving Percorten-V to my pet? Do not give Percorten-V to your pet if the pet has a serious bacterial, viral or fungal infection. Percorten-V weakens the pet's immune response and its ability to fight infections. Tell your veterinarian if your pet has kidney or liver disease, heart disease, stomach ulcers, hypothyroidism, diabetes mellitus or any other medical conditions. Also tell your veterinarian if the pet is pregnant or lactating. How should Percorten-V be given? Give this medication exactly as directed by your veterinarian. Do not give more or less than is prescribed by the veterinarian. If you do not understand the directions ask the pharmacist or veterinarian to explain them to you. 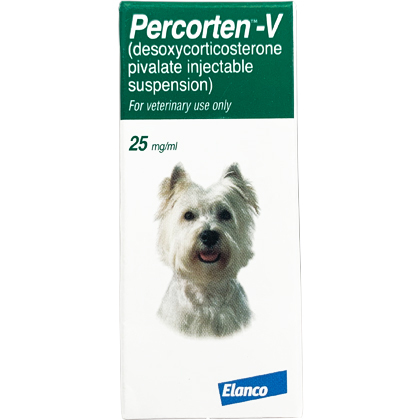 The usual dose of Percorten-V in dogs is 1mg/pound given by IM injection every 25 days. Store Percorten-V at room temperature away from moisture and heat. Keep this medication away from children and pets. Reduce dosage in dogs showing signs of hypernatremia or hypokalemia. What are the potential side effects of Percorten-V? If any of the following serious side effects occur, stop giving Percorten-V and seek emergency veterinary medical attention; an allergic reaction (difficulty breathing; swelling of the lips, tongue or face; hives), increased blood pressure or sudden weight gain. Like other adrenocortical hormones, Percorten-V may cause severe side effects if dosage is too high or prolonged. Other less serious side effects may occur. Continue giving Percorten-V and talk to your veterinarian if your pet experiences insomnia, nausea, vomiting or stomach upset, fatigue, depression, muscle weakness or joint pain, problems with diabetes control or increased hunger or thirst. Other side effects that occur rarely, usually with high doses of Percorten-V include thinning of the skin, cataracts, glaucoma, behavior changes. Other side effects may also occur. Some of these effects may resolve with adjustments in dose or interval of Percorten-V or concomitant glucocorticoid administration. Talk to your veterinarian about any side effect that seems unusual or bothersome to your pet. What happens if I miss giving a dose of Percorten-V? Give the missed dose as soon as you remember. However, if it almost time for the next dose, skip the dose missed and give only the next regularly scheduled dose. Do not give a double dose of this medication. What happens if I overdose my pet on Percorten-V? Seek emergency veterinary medical treatment. Symptoms of overdose may include swelling or water retention, high blood pressure, weight gain, low levels of potassium in the blood, and Cushing's disease. What should I avoid while giving Percorten-V to my pet? Avoid sources of infection. Do not use any preventative vaccines without checking with the veterinarian. What other drugs will affect Percorten-V? Do not give any other over the counter or prescription medications, including herbal products, during treatment with Percorten-V without first talking to the veterinarian. Tell your veterinarian if your pet is taking Phenobarbital, furosemide, insulin or glipizide, phenytoin, digoxin, warfarin, or aspirin. Drugs other than those listed may interact with Percorten-V resulting in side effects or altered effectiveness. Percorten-V is a prescription medication that is commonly used by veterinarians in dogs for the treatment of Addison's disease. Percorten-V is a corticosteroid used to treat conditions, such as Addison's disease, in which the body does not produce enough of its own steroids. 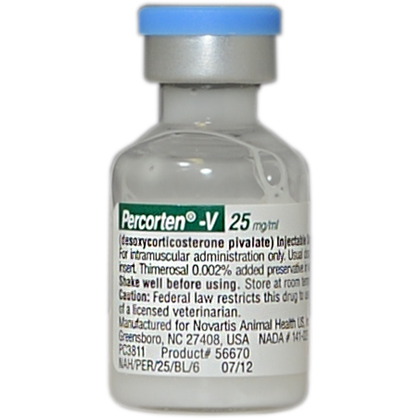 Percorten-V is available as a 4 ml multi-dose vial containing 25 mg/ml and is administered IM (intramuscularly). Do not administer IV (intravenously). Percorten-V should not be stopped suddenly. Irritation at the injection site may occur.